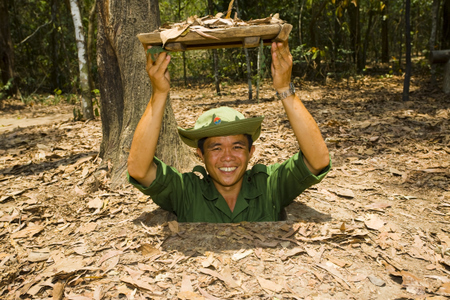 With its war pasture, Cu Chi tunnels in the history of the heroic struggle the people of Vietnam as a legend of the 20th century and became famous in the world. Cu Chi Tunnels, Ho Chi Minh City to 70 km to the northwest. This is miniature battle versatile of the army and people of Cu Chi during the war raged for 30 long years against invaders for independence and freedom for the country, is a unique architecture, deep in the underground with many stratums, such as arachnoid corner, with accommodation, meeting and fighting with a total length of over 200 km. Ben Drug Tunnels: Based Park & ​​Military Region Party Committee of Saigon - Gia Dinh is protected in Phu Hiep Hamlet, Phu My Hung Commune, Cu Chi district of Ho Chi Minh City. Tunnels of Ben Dinh Cu Chi District Party Committee is preserved in Ben Dinh Hamlet, Peter Duc Commune, Cu Chi district of Ho Chi Minh City. 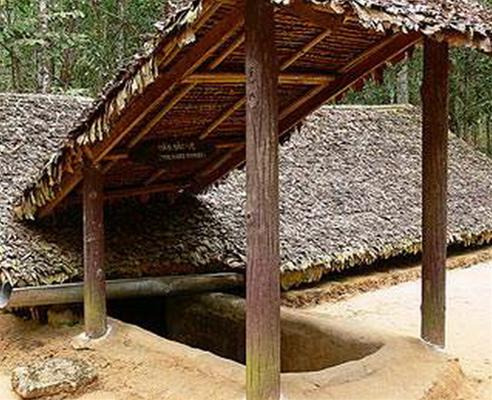 The area is re-releasing the Cu Chi area of ​​50 ha, the population of the area historic Cu Chi Tunnels. The work includes many items, recreate the event in the fight against the invaders through several stages, thereby creating a vibrant information and practical for travelers on land in Cu Chi during the war. On the land of the famous Cu Chi tunnels in the past and right in the heart of "iron triangle" a thunder bombs. On 05/19/1993, party and people of Ho Chi Minh has created works: Martyrs Memorial Temple MEDICINE BEN - CU CHI. Temple was built to commemorate the huge fellow soldiers who fought and sacrificed on the Saigon - Cho Lon - Gia Dinh; in the wars against the invaders against the French and American. As a project for future generations remember, gratitude and pride. The temple was started on 19.05.1993, in commemoration of 103 th birthday of President Ho Chi Minh - the beloved leader of the people of Vietnam, on an area of ​​7 ha in area of cell populations historic Cu Chi Tunnels. On 19/12/1995 inaugurated the temple and began to stage a welcome home and abroad to commemorate, burning incense and maybe think about a survival made ​​national soul. And the City Party Committee, VFF TP. Ho Chi Minh also selected on 19/12 annual Memorial Day festivities and honor the heroic martyrs.